There are so many types of flour available, so find out a bit more about some of them – how they are milled as well as the uses they are best suited to. To find out how flour is milled from grain see our How flour is made page. Wholemeal – This is made from the whole wheat grain with nothing added or taken away. Brown – This usually contains about 85% of the original grain. Some bran and germ have been removed. White – This usually contains around 75% of the wheat grain. Most of the bran and wheatgerm have been removed during the milling process. Wheatgerm – This can be white or brown flour with at least 10% added wheatgerm. Malted wheatgrain – This is brown or wholemeal flour with added malted grains. Stoneground – This is wholemeal flour ground in a traditional way between two stones. Organic –This is made from grain that has been grown to organic standards. Growers and millers must be registered and are subject to regular inspections. Mixes – there is also an increasing range of flours and mixes containing added seeds or a blend of different grains available. You can also get flours which are not made from wheat. Other grains used include rye, maize and oats. Flours can also be made from nuts such as hazelnut and also coconut, potato, peas and chickpeas. 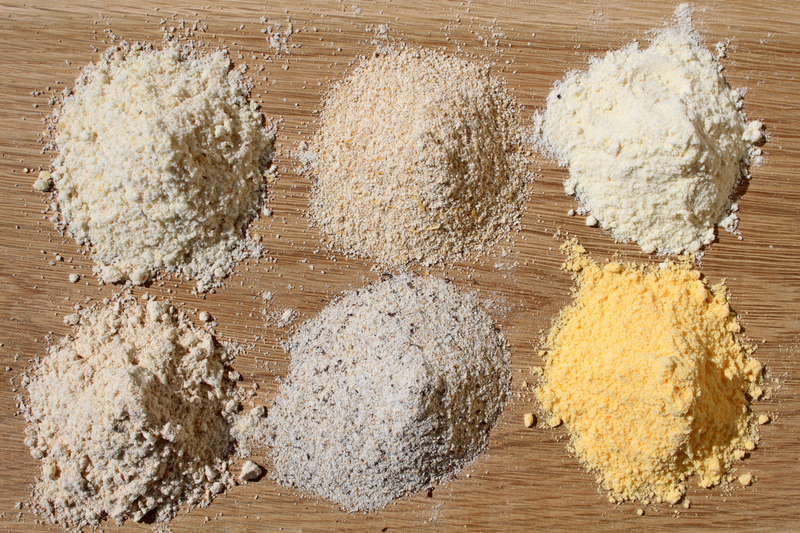 Though each of these flours will have a different nutritional make up to wheat flour and to each other, they are not inherently better for you. Unless you have an allergy to gluten there is no medical or health benefit to choosing a non-wheat flour. With all of this choice available, it can be hard to know which flour to use for which job, so take a look at our page Plain flour or self raising flour, which flour is best for the job.